This family-friendly Kangaroo Point hotel is located in the entertainment district, within a 15-minute walk of Kangaroo Point Cliffs and Eagle Street Pier. Story Bridge and The Gabba are also within 1 mi (2 km). Brisbane Central Station is 23 minutes by foot and Brisbane Fortitude Valley Station is 29 minutes. Located in the heart of Kangaroo Point, this apartment building is within 1 mi (2 km) of Queen Street Mall and The Gabba. Roma Street Parkland and Tivoli are also within 2 mi (3 km). Brisbane Central Station is 20 minutes by foot and Brisbane Fortitude Valley Station is 26 minutes. 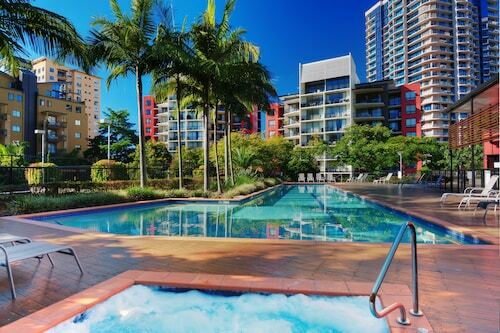 Situated in the business district, this apartment building is within a 15-minute walk of St Vincent's Hospital Brisbane, Story Bridge, and Eagle Street Pier. Queen Street Mall and The Gabba are also within 2 mi (3 km). Brisbane Central Station is 22 minutes by foot and Brisbane Fortitude Valley Station is 28 minutes. 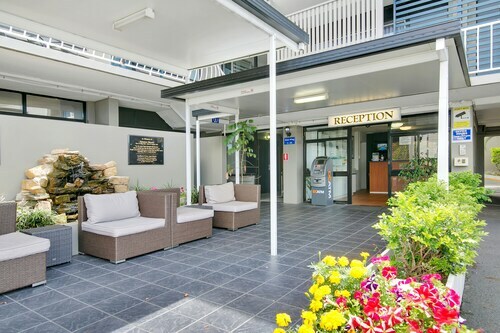 Situated in Kangaroo Point, this motel is within a 15-minute walk of The Gabba, Kangaroo Point Cliffs, and Mater Private Hospital Brisbane. South Bank Parklands and Eagle Street Pier are also within 1 mi (2 km). South Bank Station is 21 minutes by foot and Park Road Station is 25 minutes. 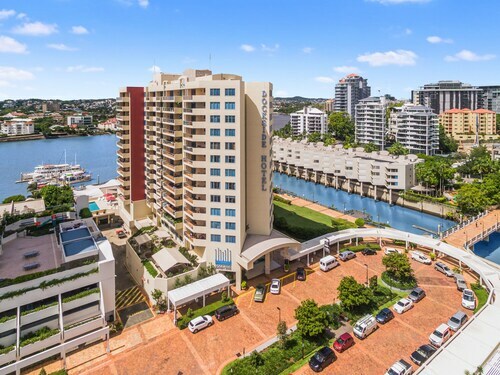 Situated in Kangaroo Point, this apartment building is within a 15-minute walk of The Gabba, Mater Private Hospital Brisbane, and Kangaroo Point Cliffs. South Bank Parklands and Riverstage are also within 1 mi (2 km). South Bank Station is 19 minutes by foot and Park Road Station is 22 minutes. Situated in Kangaroo Point, this luxury apartment building is within a 15-minute walk of Sydney Street Ferry Terminal, Eagle Street Pier, and Story Bridge. Brisbane Botanic Gardens and Queen Street Mall are also within 1 mi (2 km). Brisbane Central Station is 23 minutes by foot and Brisbane Fortitude Valley Station is 29 minutes. 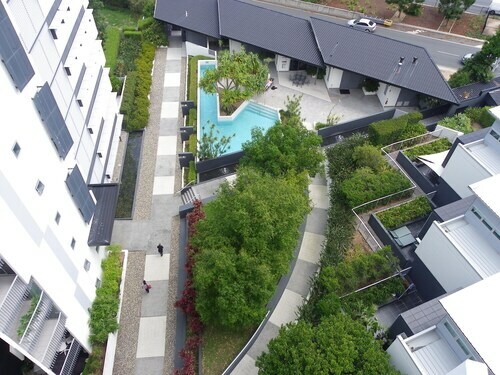 Situated in Kangaroo Point, this luxury apartment building is within 1 mi (2 km) of Sydney Street Ferry Terminal, Brisbane Botanic Gardens, and Kangaroo Point Cliffs. Eagle Street Pier and The Gabba are also within 1 mi (2 km). Brisbane Central Station is 23 minutes by foot and South Bank Station is 29 minutes. Going to Brisbane? There are plenty of great locations to choose from. But if you want somewhere inner-city, close to shopping and nightlife and with a good view to boot, Kangaroo Point is a winner. There are plenty of places to stay in this area no matter what you’re looking for, so save by booking your Kangaroo Point accommodation with us. Brisbane is Queensland’s capital and Australia’s third largest city. Kangaroo Point is directly east across the river from the Central Business District, and from your Kangaroo Point hotel it’s easy to walk or catch the bus or ferry to the rest of the city. Check out Queen Street Mall’s Myer Centre and fashion outlets, Fortitude Valley’s nightclubs and the diverse restaurants and culture at South Bank. Kangaroo Point is famous for its heritage-listed cliffs, which overlook the river. From the top you can find not only marvel at the view of Brisbane but also walk, cycle, picnic or take advantage of the BBQ facilities. Give your muscles a workout with a rock climb or conquer your fear of heights by abseiling down the cliff. For a more relaxing experience, take a kayak ride down the river. Just make sure you don’t fall in! One of the area’s most well-known landmarks is The Story Bridge, which connects Kangaroo Point to the uber-trendy suburb of New Farm. The heritage-listed steel cantilever bridge was opened in 1940 and still carries cars, pedestrians and cyclists across the river. The bridge lights up at night and makes for an impressive view as you sip a beer at a riverside bar or charge down the Brisbane River on a ferry. Those who crave a closer look can take an adventure climb to the top. Kangaroo Point has a number of restaurants and fast food places around Main Street and Lytton Road, and you won’t have to go far for a night out: Story Bridge Hotel is tucked under the iconic bridge and has beer, steak and casual dining. Pineapple Hotel opened in 1864 and is still a popular place for dinner, drinks or a function. Brisbane Jazz Club is right next to the water and features live jazz every Thursday to Sunday. Kangaroo Point is close to the major highways leading to both the Gold Coast and Sunshine Coast. So once you’ve experienced what the Point has to offer, wot’s stopping you seeing the rest of Brisbane? Book your Kangaroo Point hotel with us and hop to it! How Much is a Hotel Room in Kangaroo Point? 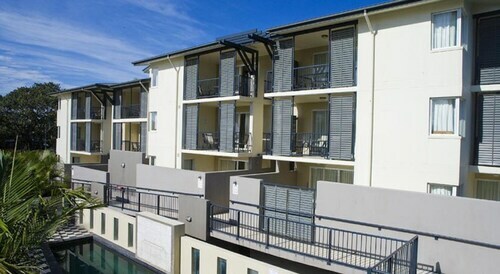 Hotels in Kangaroo Point start at AU$90 per night. Prices and availability subject to change. Additional terms may apply.